Looking back at a tumultous year, we have to conclude that not much has really changed. DNU has grown, and more people are willing to fight for what they want but… there are still cuts worth millions in the humanities faculty, the VU and UvA merger will still go through, the UvA is still managed completely from the top down with a small managerial elite, who hold the principal objective of profit maximisation, making all the decisions. Despite the events and the huge spectacle of the Maagdenhuis, the struggle still must continue as nothing has changed” explained a spokesperson of DNU. The DNU and the University of Colour want to build a broader nationwide movement which will fight for decolonisation and free and emancipatory education. The nationwide demonstration on the 17th of November will be the first step towards these goals. The 17th of November is known worldwide as The International Student Day. 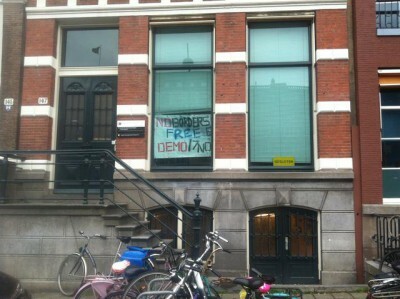 DNU hopes for the 17th to become a yearly day of protests where it can focus all of its organisational power alongside that of the DNU factions at other Dutch universities. In countries such as Greece, Denmark and England actvivists will also be holding demonstrations, strikes or more decentralised actions on the same day. The squatting action of today symbolises the start of a renewed wave of action from DNU, they will no longer wait quietly for petitions to be ignored and committees to be decided upon. They will do what they need to to win the battle. And a nice office on the canals in Amsterdam comes with that! << Melbourne: Is this justice for Wayne ‘Mouse’ Perry ?